Foreign bodies forgotten or missed in abdomen include cotton sponges, artery forceps or other instruments, pieces of broken instruments or irrigation sets and rare tubes. Presence of retained surgical blade as foreign body is uncommon and significant patient safety challenge. Most common etiologies for presence of such foreign bodies are accidental, traumatic or iatrogenic. Most common surgically retained foreign body is the laparotomy sponge. We report the management of a case with a rare foreign body in the abdomen i.e. 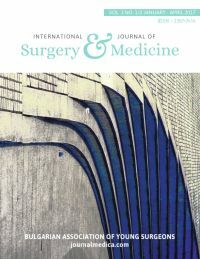 surgical blade and repair of congenital diaphragmatic hernia. A 38 yrs female reported to us with X-ray lumbo-sacral spine showing radio-opaque object in abdomen. We further investigated the patient and CT scan abdomen revealed A metallic foreign body in the left hypochondrium just beneath the left lobe of liver; it was seen in close proximity to the transverse colon gut loops and left Diaphragmatic Eventration hernia herniation of stomach, large bowel loop and omental fat into left hemithorax. Traditionally, diaphragmatic hernia was repaired by laparotomy and foreign body was removed after exact localization on C-arm.